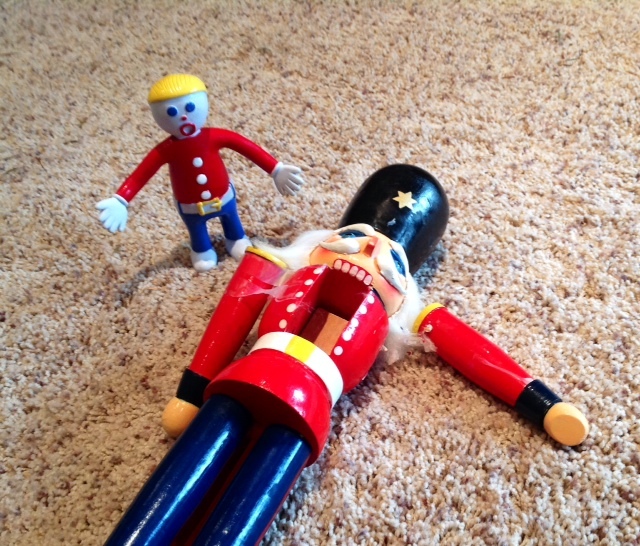 The old soldier fell out of the ornament box and surrendered on the floor. His left arm finally rebelled against years of reapplied glue, and his right arm no longer felt secured under the yellowed scotch tape. A boot was missing, his mouth no longer opened, and his cracker wouldn’t crack. I could relate in so many ways. I imagined hearing the sad military song “TAPS” playing somewhere, and the sound probably came from the box of unwrapped musical toys I kept for the tree. The old nutcracker’s sentry duties were done after standing at attention on the mantel every December for more than 20 years. Packed and unpacked, moved, stored, dusted, taped, glued, and then perched into position, he watched as the small children grew up, moved away, and then brought children of their own to play in front of the fireplace. He maintained his sturdy composure, a favorite fixture in the background throughout decades of Christmas photographs. I picked up the sentimental soldier and determined he was beyond repair. I suspected the other decorations had been grumbling about his declining health because obviously he couldn’t see or hear very well, and he probably fell asleep during his watch. The angel in the snow globe shook her head and scattered her irritation like bits of frosty frowns, the wise men in the Nativity scene muttered that he should retire and ride off on a camel, and even durable Mr. Bill cried, “Oh, no!” and wondered why the character continued to perch on the mantel year after year when there were so many younger decorations waiting their turn. What happens to old nutcrackers? To my knowledge he had never cracked a nut and I wondered if his entire life had been a fraud. Or, maybe he accepted his lofty position on the mantel, content to come out for one month every year and guard the family. I didn’t want to throw him away in the garbage or keep him in the bottom of the ornament box with the cluttered, broken debris. After serious contemplation, I devised a list of suggestions for how to properly retire a dead nutcracker. Resist the urge to throw him into the fireplace in front of the children. This unacceptable behavior could lead to expensive counseling bills. Don’t tell the grandkids a mushy story like the Velveteen Nutcracker. There is no way he can be rubbed, loved, or cajoled into humanity. Don’t be tempted to donate him to the local ballet for a future performance of “The Nutcracker.” They probably have bins and boxes full of dead nutcrackers. Don’t give him to the local gun club for target practice. We’re desperately trying to avoid the current plethora of inflammatory issues so we’ll play it safe with snow globes and candy canes. Here’s the only answer: Glue and duct-tape all the parts together, tie a bow around his neck, and give him to the grandchildren. Then their parents have to deal with him. According to German folklore, nutcrackers were given as keepsakes to bring good luck and to protect the family home. The legend says that a nutcracker represents power and strength and serves like a trusty watch dog guarding the family from evil spirits and danger. My nutcracker performed his duties for two decades, and we were safe. To honor my dead soldier, I toasted him with a mug of Christmas cheer. It was only sensible to toast him 20 times. Too funny!!! Yes, wise to pass along treasured friends, even wooden ones. It’s perfect payback for our kids. I’m going to go get myself a nutcracker today and break his arm….just so I can toast in solidarity.